No new podcast this week, folks. Due to technical difficulties beyond our control, The Podwits can’t serve up a new cast this time. HOWEVER, we’re happy to bring you back one of the tried and true audio delights from our past! Set the Time Circuits to November 2012… Disney just bought Lucas, and the Podwits had a thing or two to say… After all, we ARE Internet know-it-alls! J and Dion also take a look back at the show that was one of Joss Whedon’s most amazing (and underrated) masterpieces… “Firefly”! Suit up! 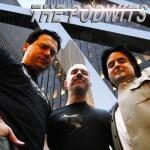 The Podwits Are Go!